Stockreversalspremium.com – Swing Trade service with SMS E-Mail and Post Alerts for entry and exit plus morning pre market updates every day! For the week ending Nov 16th, indices fell sharply into Wednesday, recovering over half the losses by Friday afternoon. The SP 500 finished the week down -1.6%, with the Russell 2000 down -1.4%, Nasdaq 100 down -2.4%, and the Dow down -2.2%. This was monthly options expiration week as well, so it wasn’t surprising to see the market give both bulls and bears a jolt. Mercury Retrograde started today and runs through Dec 6th, so we expect to see a few twists and turns during this window. 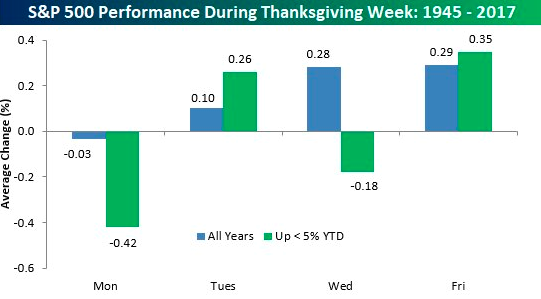 Good news is that next week is Thanksgiving, which historically has a bullish tilt to it (except Monday). As mentioned last week “…the expected part of this rally is over. Now the question is does it try and extend for the upper resistance levels (2842) or pull back in a corrective leg from here (2709 or 2684 respectively).” The market actually bounced off a smaller fib just below the 2684, which is located at 2668 (actual low = 2670), and rallied strongly off of there. 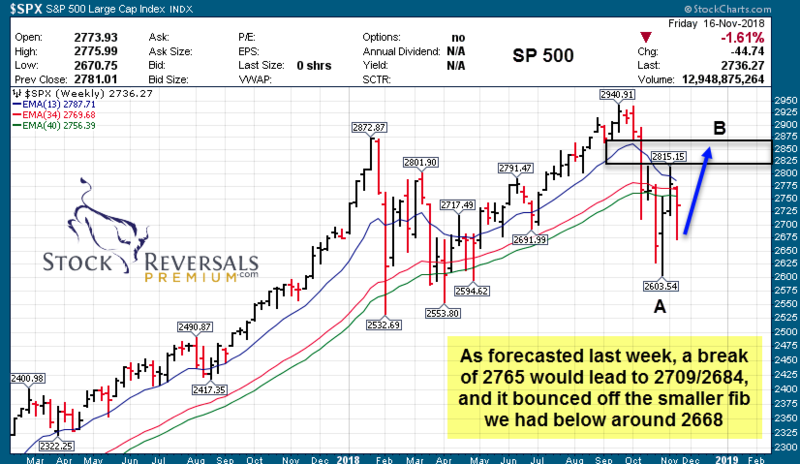 At this point, as long as last week’s lows do not get breached, we expect the market to attempt a retest of 2815 or possibly 2850-60 resistance above there, in what we think is a larger corrective B wave in progress. 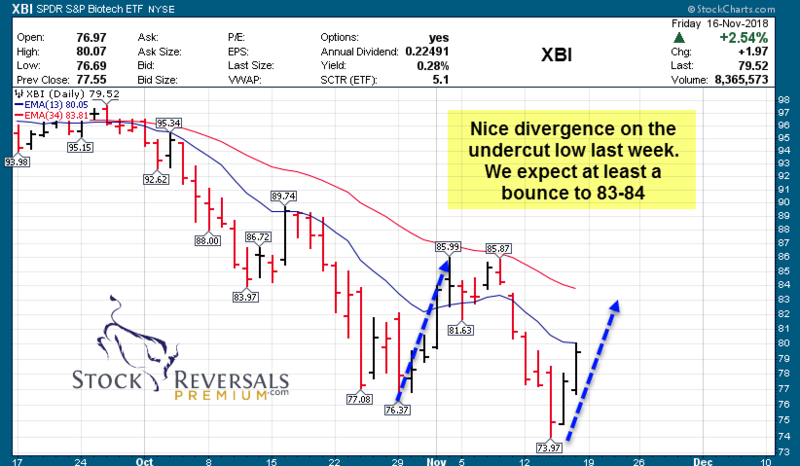 Biotech (XBI) was down -1.5% for the week, but we like the sector here for a higher bounce. Breadth indicators, smart money bullishness, fear/greed index, and overall predominant bearish articles on financial media websites are telling us that the market has more of a bounce to go towards higher targets. 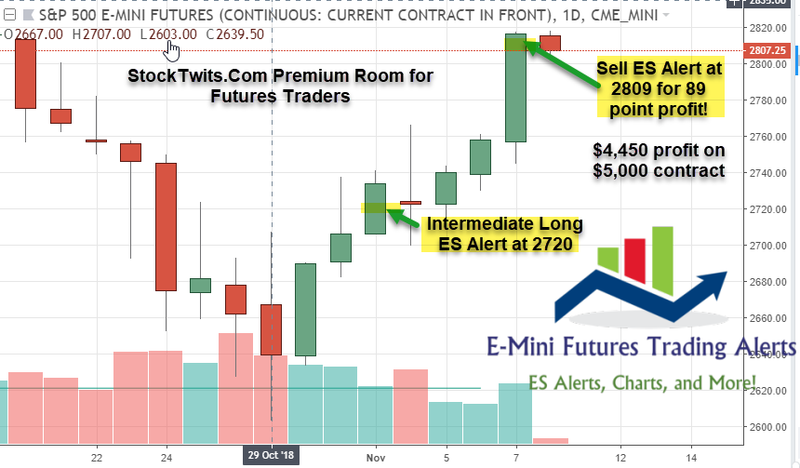 Our Premium service continues to run on all cylinders as we eagerly are sifting through names and issuing new stock alerts, which we may hold only days or weeks at a time. We have a 72% Profitable Trade track record since September 2013 inception! Recent samples include EB which we rode for 15% gains recently off oversold conditions. 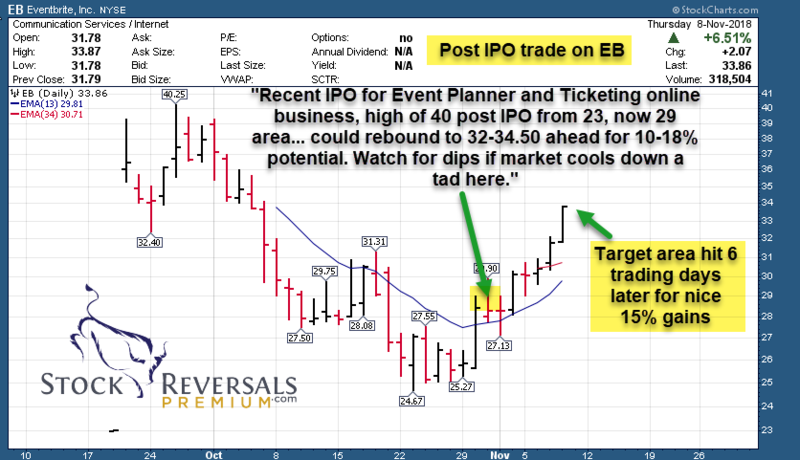 This past Friday we issued an alert on another recent IPO looking for 13-16% plus swing gains. Our past 3 trades closed gained 9%, 12% and 13% with only a 7-8 day hold period. $5000 invested in each trade would have paid for about 3 years’ worth of subscription. Think about that! Swing Trade Candidates: Each week we provide 8-15 Swing Trade ideas to consider as part of our SRP service. We often pick a few from the list during the week as actual alerts. This week we have 15. BEAT – sector leader in a consolidation off 2 week upthrust off major corrective lows. Mobile and wireless medical technology company, provides cardiac and mobile blood glucose monitoring (BGM). FTNT – double inside week of lows, hovering above weekly 34ema. A buy for at least a 5-7 move. Provides broad, automated, and integrated cybersecurity solutions worldwide. GOOS – breakout from 5 month base pattern to new highs on massive volume. Any consolidation above 66-67 a buy for higher. Designs, manufactures, and sells premium outdoor apparel. YETI – post IPO base, target 18+. Strong rally off the lows Friday. Looking solid still. Designs, markets, and distributes products for the outdoor and recreation market. TWLO – inside week consolidation after gap up last week. Provides a cloud communications platform. TTD – Bounce off weekly 34ema, with strong close end of week on large volume. Holding gap up from Aug. Provides a self-service omnichannel software platform that enables clients to purchase and manage data-driven digital advertising campaigns. MOMO – Perfect 1:1 symmetry and bounced. 38-40 would be likely if China starts to rebound, which we think it will. Chinese provider of mobile social networking platform. VEEV – Inverse H&S setting up, consolidation past week. Company provides cloud-based software for the life sciences industry. 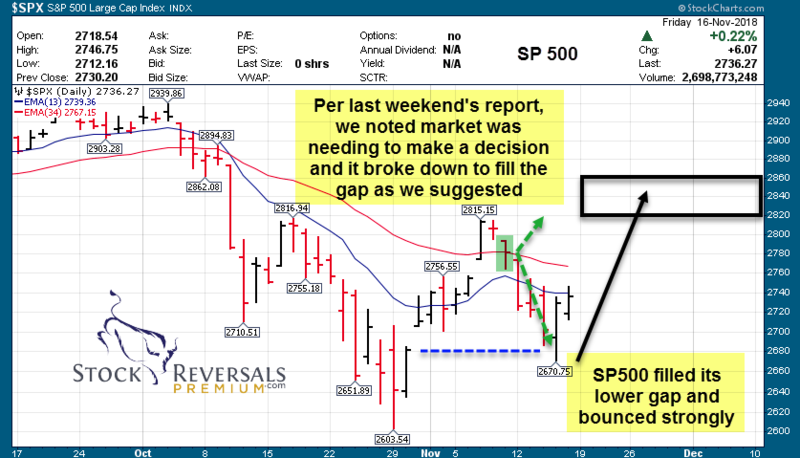 POST – Earnings gap up and go. Consolidation above 94 is a buy. Operates as a consumer packaged goods holding company. MEDP – consolidation off 2 week upthrust off major corrective lows, with inverted H&S to boot. As said last week, “62 possible but better entry is on pullback to 55-56.” Clinical contract research organization, provides scientifically-driven outsourced clinical development services to the biotechnology, pharmaceutical, and medical device industries worldwide. HZNP – gap fill this week after new 52 week high breakout. Closed the week strong, look for continuation higher. Biopharmaceutical company, focuses on medicines that address unmet treatment needs for rare and rheumatic diseases.